Tomato sauce, basil, garlic, and wine deliver the flavors of Italy to this quick pasta dish. Bring a large pot of water to a boil, and add 1 tablespoon oil. Cook pasta in boiling water until al dente. Place pasta in a colander and give it a quick rinse with cold water. Heat remaining olive oil in a 10 inch skillet over medium heat. Cook garlic, stirring constantly, until the garlic is tender, about 1 minute. Do not let the garlic burn. Add shrimp and cook for 3 to 5 minutes. Remove shrimp from the skillet and set aside. Stir tomatoes, wine, parsley and basil into the skillet. Continue cooking, stirring occasionally, until liquid is reduced by half, 8 to 12 minutes. Add shrimp and continue cooking until the shrimp are heated through, about 2 to 3 minutes. 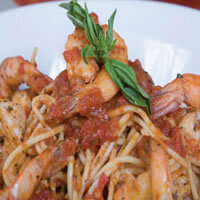 Serve the shrimp mixture over the pasta. Sprinkle with Parmesan cheese.